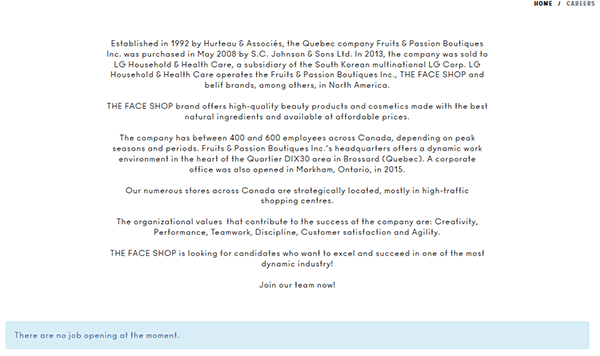 Use the guide on this page to learn how to fill out and submit the Face Shop job application (online). The instructions posted in the below section detail how to navigate the company’s employment site, search for current openings, create an account, and fill out/submit an application. Several different types of careers can be applied for however the instructions provide an overview of how to apply for retail positions. About the Company: The Face Shop is an international skin care/cosmetics retailer based out of South Korea. The company operates numerous retail locations in countries throughout the world. The Face Shop was founded in 2003. Step 1 – Copy/paste the following URL into a new tab/window within your web browser to open the company’s careers page. Note: The below URL is for Canadian applicants. Step 2 – Scroll down the page to view a list of current openings. If there are no current openings then “There are no job openings at the moment” will appear. 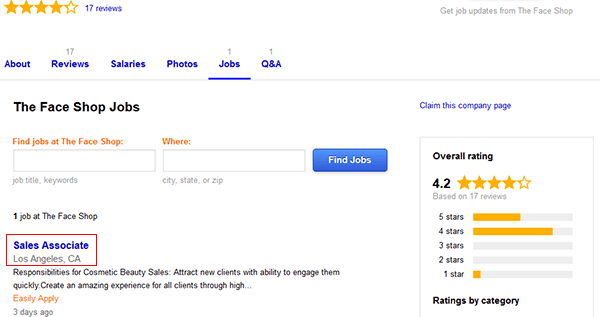 Step 3 – An alternative way of searching for current job openings is to go to the company’s Indeed.com profile. Click here to open this page in a new tab/window. Step 4 – Press the “Jobs” link to view the list of current job openings. Step 5 – Click the link/title of the job that you want to learn more about/submit an application for. Step 6 – Click the button as outlined in the below screenshot. Step 8 – Continue to fill form by submitting the required details into the various sections/subsections.